At Advantek Pet, we’re committed to developing products that bring both comfort and joy to the furry members of your family. But as the holidays near, it’s hard not to think about the less fortunate pets who have either gone missing or haven’t yet found their forever family. That’s why we’re focused on gift-giving at all times of the year. 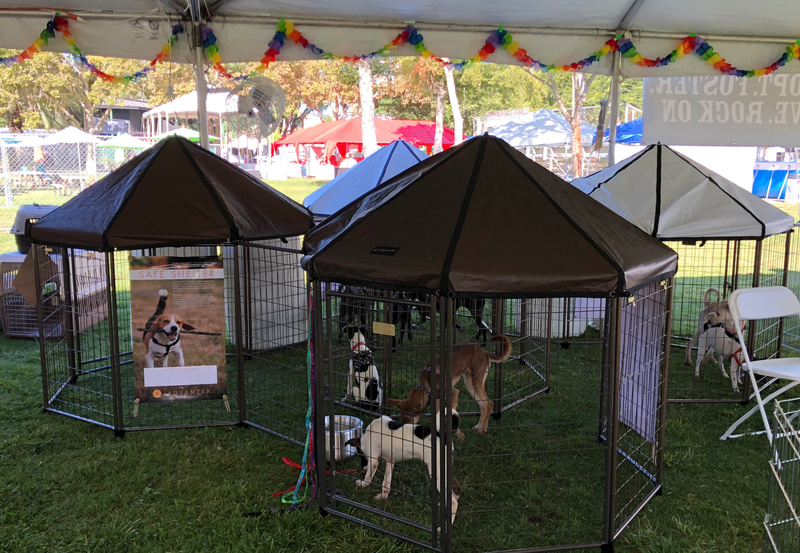 We’re pleased to have provided PET GAZEBO® donations to various local charities including Ventura County Animal Services, Rocket Dog Rescue, and Las Vegas Doberman Dachshund Rescue. In December 2017, our county was ravaged by the Thomas Fire. The devastation resulted in the loss of homes as well as the displacement of hundreds of Ventura County animals. The Ventura Fairgrounds served as a temporary sanctuary for evacuated and displaced pets. When we heard about all the animals being sheltered at the Ventura Fairgrounds during the Thomas Fire, we emptied our local warehouse and loaded up our truck with all our available PET GAZEBO® kennels and made a special delivery to our friends at Ventura County Animal Services, who worked alongside various animal service organizations around the clock to keep all pets safe. More recently, we’ve been proud to partner up with many other phenomenal animal organizations dedicated to pairing rescue pets with their perfect families. The adoption event was such a hit, Rifken said that 98 animals were adopted that day. 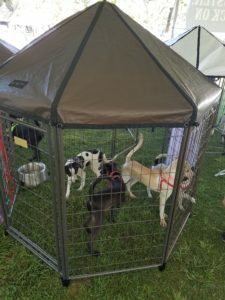 “We are planning to use the PET GAZEBO®s at our weekly adoption events (and) bring tons of attention to see our adoptable pups romping around in them,” he added. Brenda Borelli, founder of Las Vegas Doberman Dachshund Rescue, received a few PET GAZEBO® donations at the Super Zoo 2018 convention earlier this year. She also plans to put the kennels to good use. No matter how you celebrate the holidays, we hope you spend it joyfully and generously. We wish you and your families a very happy holiday season! Show how much you love your pet this holiday season, by giving them the PET GAZEBO®. Whether you’re at home or on the go, it’s the perfect way to keep your pets both happy and safely contained. You can also customize your PET GAZEBO® the way you want with our various accessories, such as canopies, window and side panels.